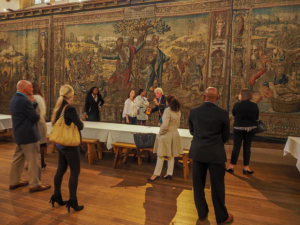 London, UK, 18 October 2017: St. Kitts and Nevis Tourism officials and destination partners returned to Hampton Court Palace on Thursday October 12, for a Tour Operator Meeting and Networking Session, which also concluded the 5th UK Destination St. Kitts and Nevis Roadshow. 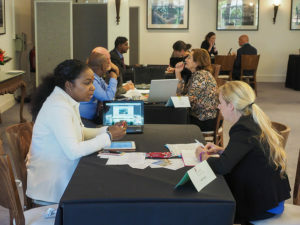 On Day Four, the historic venue of Hampton Court Palace in Surrey provided a platform for St. Kitts and Nevis hoteliers and travel services to facilitate new business and to build on existing business during a day of individual tour operator meetings. Partners met with a range of tour operators, including Bailey Robinson, Osborne & Ebel, Red Savannah, British Airways Holidays, Expedia, The Turquoise Holiday Company and Funway Holidays. Destination Partners and tour operators enjoy a tour of Hampton Court Palace. 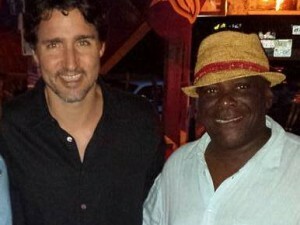 Minister the Hon. Lindsay F.P. Grant and CEO’s Greg Phillip and Racquel Brown in the company of Hampton Court Palace warders. The meeting sessions concluded with a tour of Hampton Court Palace for tour operators and partners while, keeping to the week’s Caribbean theme, the final networking evening and dinner of Destination St. Kitts and Nevis served up authentic Caribbean fayre against a background of steel pan entertainment. Addressing the evening audience which included specially invited guests, Minister Lindsay F.P. Grant thanked tour operators for their support and acknowledged the special and long partnership with British Airways. Minister Lindsay Grant and CEO’s Greg Phillips and Racquel Brown, acknowledge Rajinder Johal from British Airways. 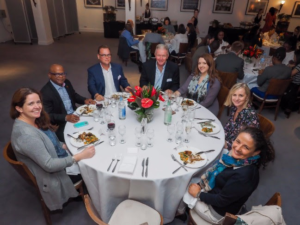 During dinner, CEO’s Racquel Brown and Greg Phillip, together with Tim Thuell, Chairman of the Nevis Tourist Board, highlighted the destinations’ appeal to UK consumers seeking authentic experiences complemented by a desire for luxury, romance, great food and adventure. Guests were also treated to a preview of both St. Kitts and Nevis’s destination videos showcasing the history, culture, food, friendly people and scenic natural beauty of the islands. CEO’s Greg Phillip and Racquel Brown address the audience. Caribbean fayre at the final networking evening of Destination St. Kitts and Nevis. 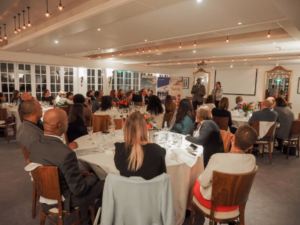 The fifth Destination St. Kitts and Nevis Roadshow, from October 8 to 12, 2017, was part of a joint marketing initiative in partnership with British Airways and destination product representatives from both islands. The week kicked off with well attended travel agent events in London and Manchester, where agents learnt the key facts about the destination through fun and educational Quiz Games and networking with partners. 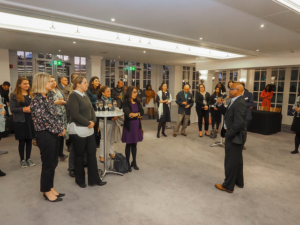 In London, a media networking event offered partners an opportunity to meet one-to-one and also network with a range of UK trade and consumer media, niche market journalists, online travel magazines, bloggers and freelance travel writers. Representing the Ministry of Tourism for the Federation: the Honourable Lindsay Grant, Minister of Tourism, International Trade, Industry and Commerce. From St. Kitts: Park Hyatt St. Kitts, St. Kitts Marriott Resort and the Royal Beach Casino, St. James Travel & Tours and the YU Lounge Private Air Terminal.